Olive's birthday is only a few weeks away. As any good parents would, we decided to put her to work producing her own invitations. My name is Tom Smith. I love sports. I play rugby for Wales and (until recently) Northampton. I also dabble in basketball (past and present), and have tried my hand at major league baseball, ice hockey and american football. I was one of the runners who symbolically defied Hitler's Olympics. I trained horses. I currently play cricket for Lancashire and Middlesex. I have played professional football for Tottenham Hotspur; Preston North End, Southampton and Queens Park Rangers; Northampton Town, Leicester City and Manchester United; Kilmarnock; Partick Thistle, Ayr United, Clydebank and Hibernian; and perhaps most famously for Liverpool. I now play for Ipswich Town and Portsmouth right now. I was a pioneer of Aussie rules football. I have been known for my flauting, saxophany, and filking, and right now I am the singer in a popular beat combo. I am a disc jockey in Little Rock. I like my politics: I have been the governor of Newfoundland and Labrador, and Carolina. I was a congressman in Pennsylvania, Indiana, Maryland, and Illinois. I have mayored in Jersey City and Philadelphia. In the UK, I've been a Labour MP. I spend some of my time now writing (plays and novels). I paint, and I paint some more. I was the Bishop of Carlisle at the end of the 17th century, and I was a general in the American Civil War. I was a mountain-man who told 'tall tales'. I found time in my hectic 17th century cloth-making life to found the first bank in England outside of London. I built lighthouses in Scotland. I have worked as a physician, a soldier, academic and barrister, and if you need any agricultural, engineering or hydraulic supplies, I can help you out with that. Or, do you need medical advice? I can help with that also. I am many more things that I have't got the time or space to tell you about. That is who I am. Who are you? I am privileged to have lots of creative friends. And even though I link to most of them on the index (over on the right), I thought I'd mention them all within the one post. You can consider it a kind of small Yellow Pages for talent. Sorry to anyone I missed. I like the paintings of Glennray Tutor. Yes, I did say paintings! He is a photorealist artist. I actually quite like this genre; I admire the intense skill and mad folly that go into painstakingly producing a painting that could easily be substituted for a photograph that would have taken an untrained civilian a split-second to create with the cheapest of cameras. Thank you to Andrew for Greek Street Car Park (a belated painted Christmas present), and to Michelle for Ludvig, the Pitcher Plant son of Vladimir. I always forget just how much disruption can be caused by the seemingly simple task of decorating a modest-sized bedroom in a mid-terrace house. I guess part of my surprise is that I didn't factor in that the change of use (spare bedroom to nursery) probably triples the amount of work involved. Although I wasn't completely in the dark about the task-list, I recall absent-mindedly thinking that a lick of paint on the walls and a spot of furniture self-assembly and we'd be done. But no, it is not that easy. Painting has taken all week, and there's still the door to do. I'm grateful to Andrew for helping me shift some big furniture from the main bedroom. And timescales for converting a built-in cupboard on one side of the chimney breast had to be extended after tentative attempts to remove some textured wallpaper revealed a far from smooth wall underneath. I'm still confident that a big push this weekend should see us largely finished by Sunday evening. Only the job of paining the mural will remain outstanding. As work has slowly but steadily progressed, so the chaos has accumulated around the house. There are piles of clothes in the bedroom, a workbench in the computer room, step ladders in the bathroom, an ex-cupboard on the stairs, a dismantled wardrobe in the lounge. Only the kitchen seems to have escaped relatively lightly. Our two new bedroom wardrobes are due to be delivered today. No time has been specified, which leaves the possibility open that it will inconveniently arrive in the evening. They are larger than the ones we have now and so will take some construction. Last night's attempt to dismantle a wardrobe we no longer want went wrong. The problem was that I bought it around five years ago from the Ikea bargain corner, and it was delivered to me fully constructed. Thus, I wasn't 100% certain how the thing was held together. Nevertheless I managed to reduce it to the base, but I couldn't quite work out how to remove the three large upright panels. Just as I figured this out and set about struggling with an allan key, the base split, rendering the whole thing useless. Annoyingly, I had already added the thing to Freecycle. this is a plug for my good friend andrew davies, who has launched a website to expose the world to his paintings. 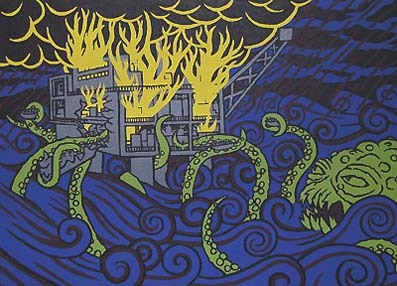 i think his works (such as 'the kraken wakes then helps out', above) are excellent; they're bold, funny, and fantastical. every home should have one.